Biotique Morning Nector Moisturizing Lotion in India. 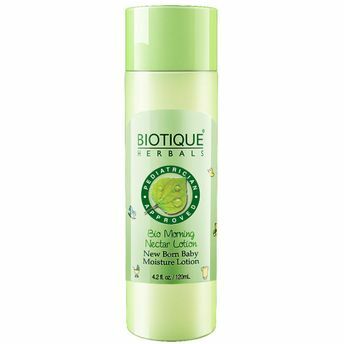 Biotique Morning Nector Moisturizing Lotion pampers your skin with the goodness of natural ingredients. This lightweight lotion is a natural blend of pure honey, wheat germ and seaweed to blanket an infant's delicate skin with nourishing moisture. Safeguards baby's body from dryness and irritation. Leaves baby feeling fresh, velvety-soft and pampered all over. Explore the entire range of Face Moisturizer & Day Cream available on Nykaa. Shop more Biotique products here.You can browse through the complete world of Biotique Face Moisturizer & Day Cream .Alternatively, you can also find many more products from the Biotique Bio Morning Nectar Moisturizing Lotion range.